Hi guys, I've been watching Big Brother lately since I've been at home. 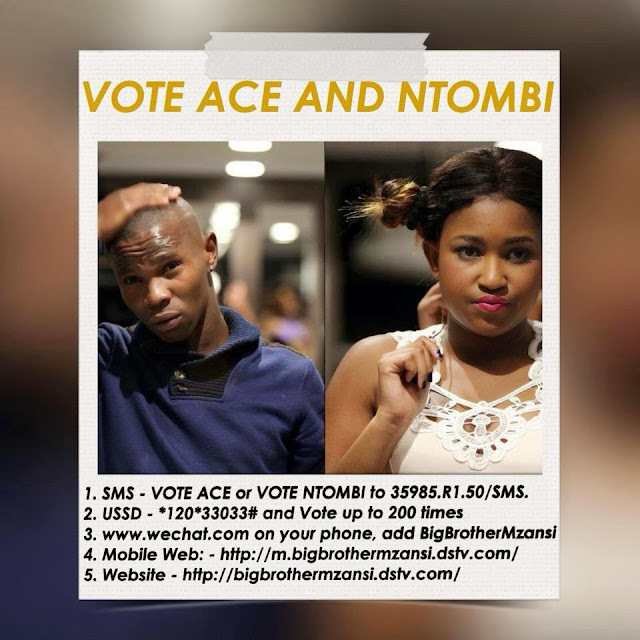 I must say that I have enjoyed watching Ntombi and Ace also known as NtombAce from day one. Ntombi has connected with most South African viewers because she is witty, an entertainer and when she does not understand something she will ask until she gets it but sometimes not e.g "The Hippy Era". Ace has that ghettoness about him and a girl from the ghetto like me gets it. There are 3 days left for voting. Please help my favourite couple take this one. *EDIT ( Ace and Ntombi won Big Brother Mzansi 2015 ) Congratulations to my favourite couple I wish them great luck in all their future plans. I loved big brother season 2.